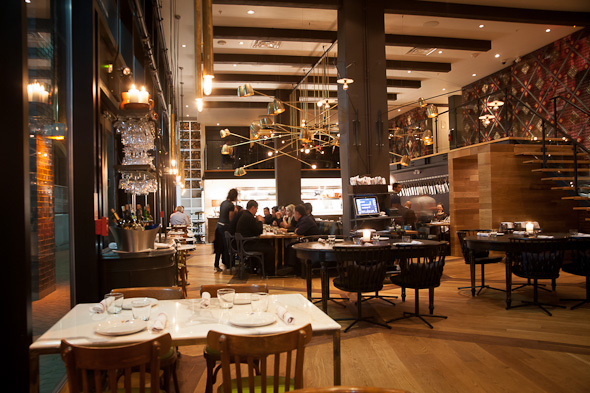 Patria is now officially open to the public after a 2-month-long soft opening that's had food enthusiasts drooling in anticipation since a sneak peak during TIFF. 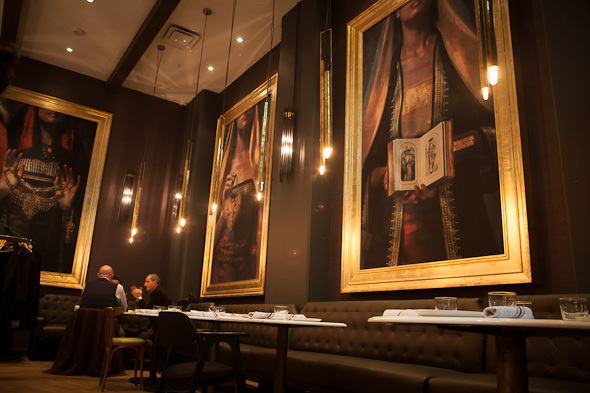 After opening American comfort concept Weslodge Saloon this past summer, owners Hanif Harji and Charles Khabouth are tackling this neighbouring restaurant which aims to offer a taste of regional Spain. 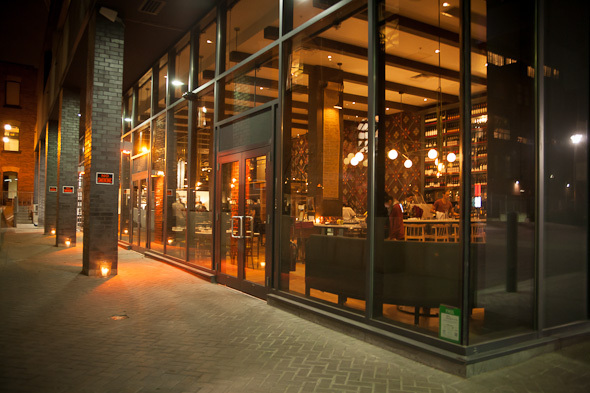 Upon entering, it's the bar that makes the first impression, as it prominently showcases an array of house-baked breads, imported cheeses, wines, and beers. Inside the dining room, the Spanish theme is dramatically interpreted by Commute Home with rich colours, eclectic painted antiques, and a fabulous embroidered mosaic from Marlo Onilla of Biography Design . 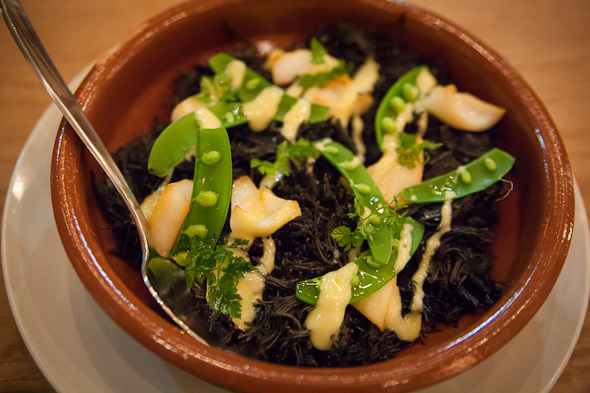 Harji and Khabouth note that Spanish cuisine is not well represented in our city, despite the fact that Restaurant Magazine has crowned Spanish restaurant elBulli nĂşmero uno on its worldwide Top 50 best restaurants list for a record five times. Now, Executive chef Stuart Cameron (also of Weslodge) is ready to showcase what we've been missing by importing the best of the best, straight from the motherland. 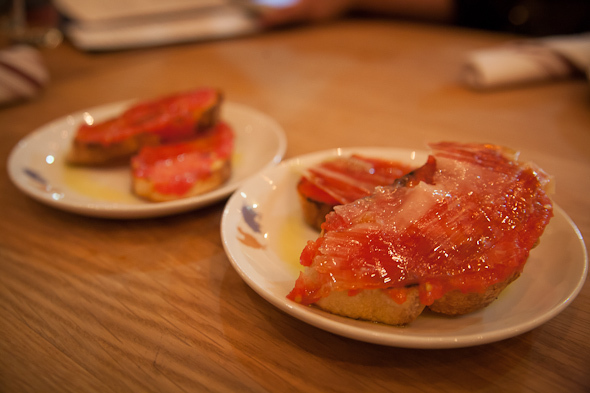 Naturally, we sample small plates from the tapas bar first, like the Pan Con Tomate ($5), that pairs the simple flavours of fresh tomato and glorious olive oil on house-baked bread, or you can choose to add roughly sliced Serrano ham ($6). 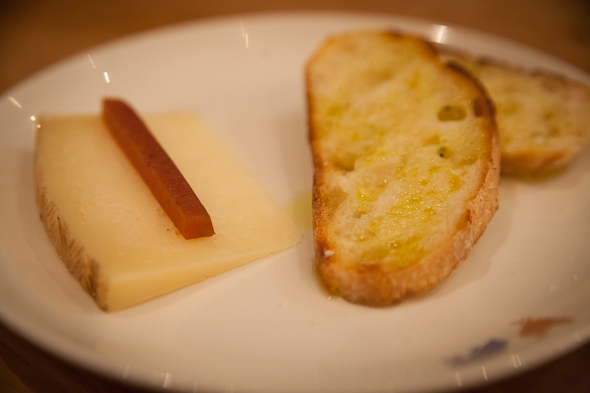 Next is the 12 Month Manchego Cheese ($8) paired with sweet quince jam, followed by the savory Pimientos Rellenos De Buey ($12), which highlights the same Manchego cheese, although this time it's grated finely atop piquillo peppers stuffed with braised oxtail. 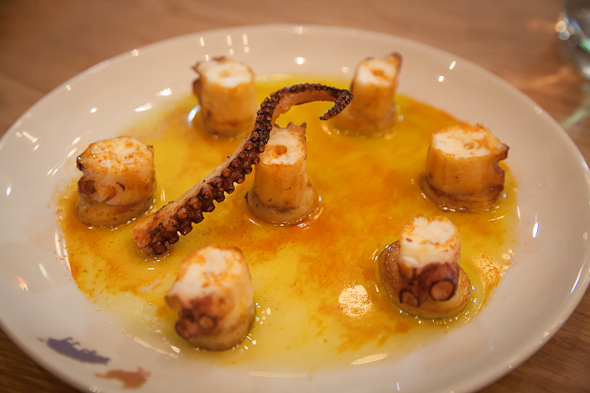 For me, the stars are bite-sized offerings such as the bacon-wrapped dates, Datiles Con Tocino Iberico ($9), as well as the Pulpo A La Gallegos ($15), featuring Spanish octopus from tonight's seafood menu (note: it changes daily) and potato in a smoky paprika olive oil. 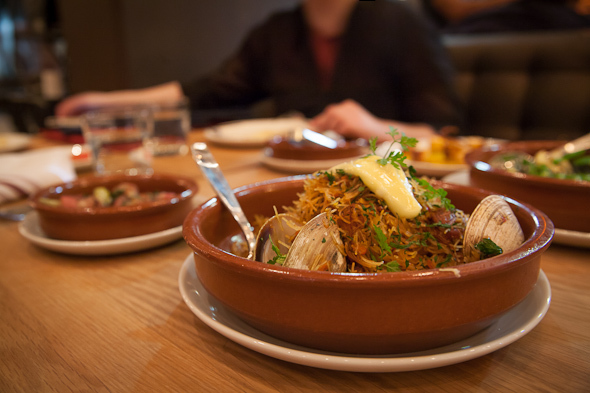 For heartier appetites, there are rich pasta dishes suitable for sharing such as the squid-ink-dyed Fideos Negros Con Chocos ($18) and the Fideos Con Almejas Y Chorizo ($16), made with Fideo pasta (an imported short angel hair variety) tossed with clams, diced chorizo, and topped with a creamy aioli that's meant to be stirred in at the table. 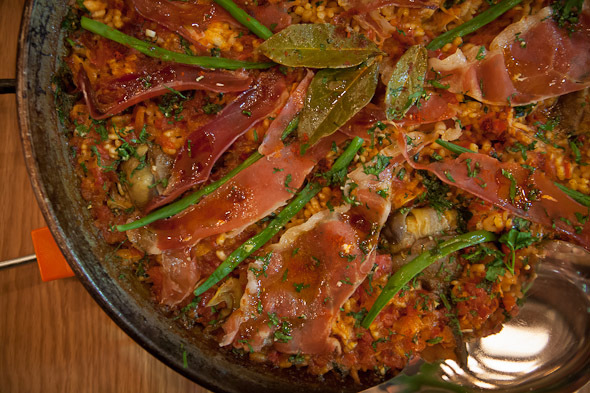 In true Spanish fashion, there are also several rice dishes to be shared, like the Paella De Conejo Alcachofas ($45) with chunks of tender rabbit, artichoke, Serrano ham, and green beans. Though desserts like the Leche Frita Con Helado De Azafran ($6) are tempting, we are too stuffed to even consider it. For my next visit, I've already made note to bring more friends and sample more plates, but for now I am leaving exactly as Patria intends: with a full belly and warm heart.